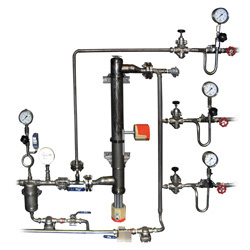 The challenges of steam and condensate systems are often very diverse; some processes may call for several tough demands on pressure and temperature control. Non-standard systems capable of proper condensate drainage become a reality with our skids, and TLV system experts are able to develop and implement a suitable solution for every technical challenge. Designing, planning, construction, and assembly all come from a single source, and in close cooperation with the customer.